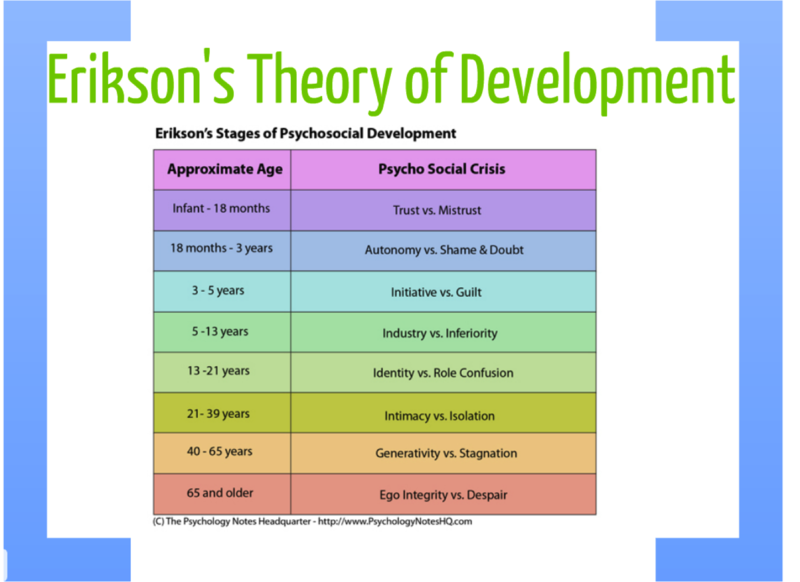 Erik Erikson theorized that people develop in psychosocial stages throughout their lives. According to Erik Erikson, there are eight different stages. The first stage occurs during an individuals first year of infancy and is called Trust Versus Mistrust. This stage sets the standard at infancy for a lifelong expectation that the world is a pleasant place to live in. The next stage is called Autonomy versus shame and doubt. This stage occurs from late infancy to toddlerhood. After gaining trust in the first stage, infants begin to discover that they are able to control their behavior and that they are subject to independence. Initiative versus guilt is Erikson’s third stage of development and occurs during the preschool years. Children in this stage being to experience new challenges in which they must act in a responsible and purposeful manner. As a result, children who act in irresponsible manners may experience guilt or anxiety. During the elementary school years children often undergo the fourth stage of development called industry versus inferiority. In this stage individuals begin to focus their energy toward mastering knowledge and intellectual skills. Identity versus identity confusion occurs during adolescence. During this time, adolescents begin to ask themselves questions such as “Who am I?” “What am I all about?” and “What am I going to do with my life?” If adolescents are able o explore these roles in a healthy manner they may achieve a positive identity. 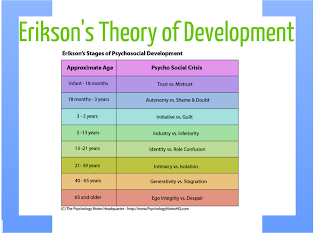 The sixth stage in Erikson’s theory is intimacy versus isolation. This stage occurs during the early adulthood years. This is a time in which individuals begin to develop intimate relationships. This stage is very dependent on the formation of healthy friendships. Generativity versus stagnation is the seventh stage and takes place during middle adulthood. In this stage individuals who are considered to have generativity often have a concern for helping the younger generation develop and lead useful lives. Stagnation is considered the feeling of having done nothing to help the younger generation. The final stage in Erikson’s theory is Integrity versus despair. Individuals experience this stage during late adulthood. During this stage individuals reflect and look back on their lives to determine whether or not they are satisfied.